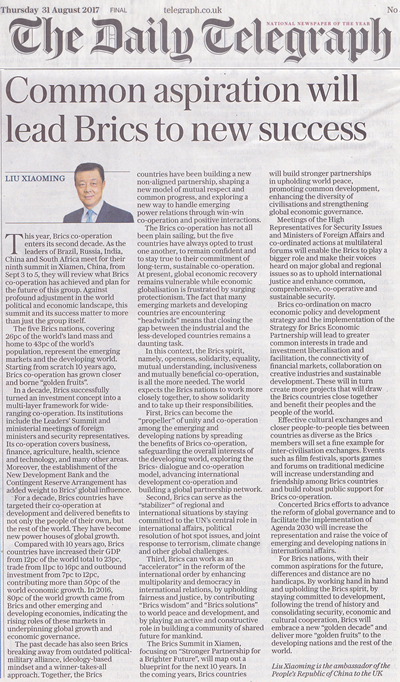 The Daily Telegraph Publishes a Signed Article by Ambassador Liu Xiaoming Entitled " Common Aspiration Will Lead BRICS to New Success "
The five BRICS nations, covering 26% of the world's land mass and home to 43% of the world's population, represent the emerging markets and the developing world. Starting from scratch ten years ago, BRICS cooperation has grown closer and borne "golden fruits". In a decade, BRICS successfully turned an investment concept into a multi-layer framework for wide-ranging cooperation. Its institutions include the Leaders' Summit and ministerial meetings of foreign ministers and security representatives. Its cooperation covers business, finance, agriculture, health, science and technology, and many other areas. Moreover, the establishment of the New Development Bank and the Contingent Reserve Arrangement has added weight to BRICS global influence. The BRICS cooperation has not all been plain sailing, but the five countries have always opted to trust one another, to remain confident and to stay true to their commitment of long-term, sustainable cooperation. At present, global economic recovery remains vulnerable while economic globalisation is frustrated by surging protectionism. The fact that many emerging markets and developing countries are encountering "headwinds" means that closing the gap between the industrial and the less-developed countries remains a daunting task. First, BRICS can become the "propeller" of unity and cooperation among the emerging and developing nations by spreading the benefits of BRICS cooperation, safeguarding the overall interests of the developing world, exploring the BRICS+ dialogue and cooperation model, advancing international development cooperation and building a global partnership network. Second, BRICS can serve as the "stabilizer" of regional and international situations by staying committed to the UN's central role in international affairs, political resolution of hot spot issues, and joint response to terrorism, climate change and other global challenges. Third, BRICS can work as an "accelerator" in the reform of the international order by enhancing multipolarity and democracy in international relations, by upholding fairness and justice, by contributing "BRICS wisdom" and "BRICS solutions" to world peace and development and by playing an active and constructive role in building a community of shared future for mankind. The BRICS Summit in Xiamen, focusing on "Stronger Partnership for a Brighter Future", will map out a blueprint for the next ten years. In the coming years, BRICS countries will build stronger partnerships in upholding world peace, promoting common development, enhancing the diversity of civilizations and strengthening global economic governance. BRICS coordination on macro economic policy and development strategy and the implementation of the Strategy for BRICS Economic Partnership will lead to greater common interests in trade and investment liberalisation and facilitation, the connectivity of financial markets, collaboration on creative industries and sustainable development. These will in turn create more projects that will draw the BRICS countries close together and benefit their peoples and the people of the world. For BRICS nations, with their common aspirations for the future, differences and distance are no handicaps. By working hand in hand and upholding the BRICS spirit, by staying committed to development, following the trend of history and consolidating security, economic and cultural cooperation, BRICS will embrace a new "golden decade" and deliver more "golden fruits" to the developing nations and the rest of the world.